Conductor Daniel Barenboim is stepping down as musical director of Milan's La Scala opera house two years early at the beginning of 2015. Stephane Lissner, superintendent of La Scala, called Barenboim's departure the "end of an era". Barenboim joined the world-renowned opera house in 2006 before becoming musical director in December 2011. Unconfirmed reports in Italian media suggested he will be succeeded by Milanese conductor, Riccardo Chailly. Lissner is also leaving La Scala in August 2014 to manage the Paris Opera and will be succeeded by Alexander Pereira, the Austrian artistic director of the Salzburg Festival. Pereira previously indicated that he would like an Italian to be the next musical director and Italian media suggested Chailly would be his choice. A decision is expected next month. 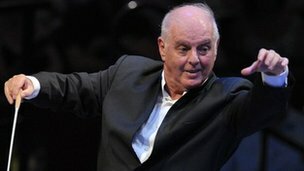 Israeli-Argentine Barenboim, 70, recently led the complete Wagner Ring Cycle at the Royal Albert Hall as part of the BBC Proms' eight-week festival in July. He will continue to work on his many other projects, including establishing an academy for Israeli and Palestinian musicians and overseeing an academy for young musicians in Berlin, housed in a concert hall built by architect Frank Gehry. Some of Barenboim's commitments at La Scala in 2014 include Rimsky-Korsakov's The Tsar's Bride, Cosi Fan Tutte by Mozart and Verdi's Simon Boccanegra. He will open the 2014-15 season with Fidelio, Beethoven's only opera.